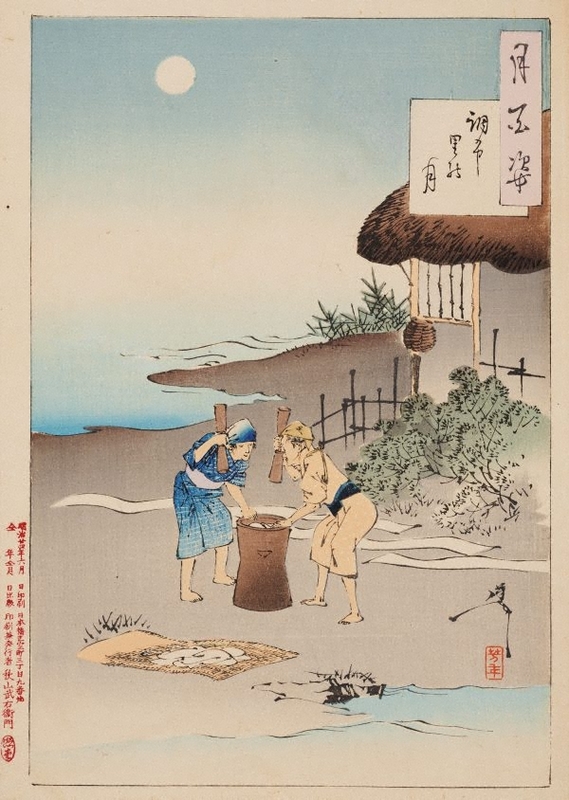 By the light of the full moon and by the river, washed clothes piled on the straw mat are being beaten with mallets by two women in order to soften them. They are then laid out to dry. The sounds of women beating cloth is associated with the notion of women waiting for their husbands (see also 258.2012.84 'Cloth-beating moon'). Chōfu (also known in Japanese as 'tatsukuri') literally means ‘tax cloth’. The town was probably known to have used cloth as payment in lieu of tax at some time. This is a common scene used in 'ukiyo-e' prints and Hiroshige had produced similar prints, often identifying the town on the Musashi plain by including Mount Fuji in the background.